We last left our heroes fighting these mad Celestials, while bugs came up from the center of the Earth and 100’s of other Celestials rained from the sky. Turns out, we picked up right where we left off, with our Avengers continuing the fight. She-Hulk hops in the fray now but somehow gets teleported to Ghost Rider and they begin to fight one another. 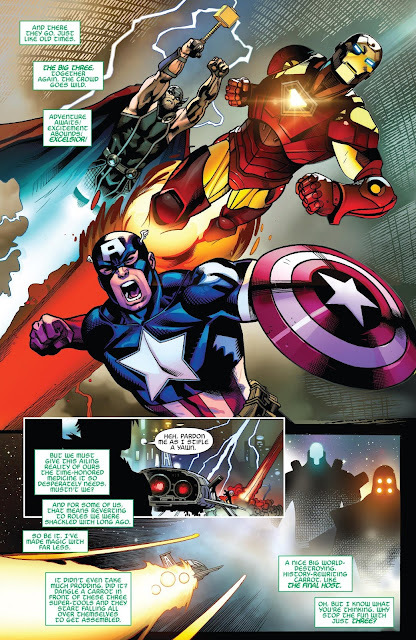 Meanwhile, Thor, Cap, and Iron Man continue to fight the Final Hosts (Mad Celestials) without even making a dent. 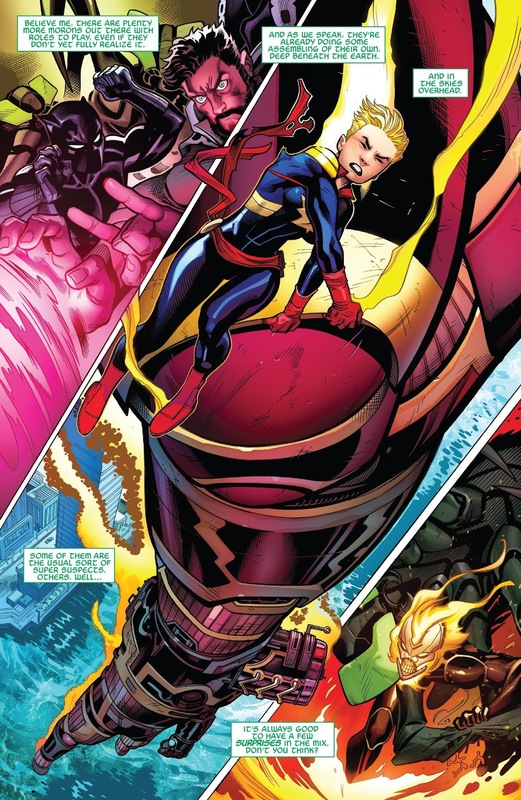 So, Captain Marvel comes down to offer her help with some warp grenades set up to teleport the Final Hosts into the sun. However, since Cap couldn’t get clear, she didn’t use them in time and our heroes suddenly became frozen in this purple force field. Well, it turns out these Final Hosts are somehow connected to Loki. 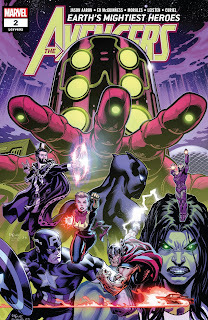 The issue ends with Loki revealing himself, She-Hulk and Ghost Rider teaming up to fight more bugs, and the Final Hosts showing us its strength by ripping a head off one of the other regular Celestials that fell from the sky and tried to put up a fight. Things just get worse for our Avengers. My thoughts: I’m going to compare this book to “No Justice” from DC. Both books started off with something Epic and World Ending that culminated in Final Hosts (Mad Celestials) or Omega Titans ( basically Mad Celestials). This week in No Justice, even though I was confused on that story, there was a ton of action, a ton of characters, a ton of excitement, and a huge reveal at the end. This issue didn’t hit those marks as well as “No Justice”. We had action, not as many characters, and a reveal that was pretty straightforward since you could read the green narrator writing to predict Loki was involved. My point is that sometimes insane action and epic team-up battles can mask a confusing and convoluted story. That may be the case in “No Justice” but is not the case here. But, what “No Justice” had in confusion, this issue lacks in epic and insane action. I wanted more character involvement and I wanted a bigger reveal. The entire issue seemed like its purpose was to involve Loki, which again we knew from the narrator word balloons. Overall, I know we don’t get the purpose of the Final Hosts yet and their reason for being at Earth, but the story rolls out with an ease for any dummy, like myself, to read... and I like that. In the end, this first arc is about getting the band back together but replacing the bassist and drummer with Ghost Rider and She-Hulk. And yes, She-Hulk would be the drummer. Ultimately, the art is fantastic and the story is an easy read. I do leave wanting more and hope to get some answers in the next issue. Knowing Jason Aaron, I’m sure we will. Definitely pick this up and keep it on your pull. Currently, move it to the top quarter of your comic stack.